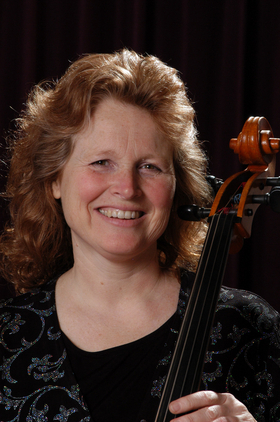 Cynthia Puls began cello studies in Evansville, Indiana. She earned a Bachelor of Music from the University of Evansville and a Master of Music degree from Louisiana State University. Cynthia formally taught as adjunct professor at Butler University, Indianapolis, IN - Marietta College, Marietta, OH - and Marshall University, Huntington, WV. Cynthia performed with the Owensboro Symphony Orchestra, Baton Rouge Symphony Orchestra, Gilbert and Sullivan Society, the Baton Rouge Opera Orchestra, Terre Haute Symphony, Southeastern Ohio Symphony, and the West Virginia Symphony. Cynthia soloed with a touring contemporary group in Louisiana including New Orleans, Baton Rouge, and Shreveport, LA. She also toured with The New Harmony String Quaretet in Evansville, IN. She developed a course entitled, "Exploring Composers" (designed to introduce composers, their styles, and form to elementary students), is founder and director of The Cello Company in Parkersburg, West Virginia (a group of young cellists ages 3 to adult), is an Artsbridge Catalog Artist in Parkersburg, West Virginia, performs in a variety of chamber groups, performed as soloist with The Evergreen String Orchestra located in Marietta, Ohio, and is a founding member of The Trillium Piano Trio. Cynthia was clinician to the 5th Annual Mid-Ohio Cello Festival at Marshall University located in Huntington, WV. As a member of The Trillium Piano Trio, currently entering their 16th season, she performs in the Kanawha Forum Series, Sundays @ Two in Tamarack, Glenville University, Saint Cecilia�s Concert Series, Lyceum Series, and the Arts Link Series. The Cello Company, founded and directed by Cynthia, performs throughout the Mid-Ohio area. Their list of achievements include: performances at the The Varga Celebration which was held in North Carolina featuring world renown cellist, Lazlo Varga, performances with the Swedish String Ensemble during their US tour, The Kremlin Chamber Ensemble from Russia, during their US tour, Sundays @ Two at Tamarack (Beckley, WV), School Tours (Belpre and Marietta, OH, Vienna and Parkersburg, WV), The Smoot Theater, The Parkersburg Art Center, numerous appearances on WTAP (Parkersburg, WV), WV House of Delegates (Charleston, WV), The Castle (Marietta, OH), the Multi-Cultural Festival (Parkersburg, WV), Beatles Bash (Parkersburg, WV), Martin Luther King Celebration (Charleston, WV), and performed with The River Cities Symphony Orchestra, The Evergreen Strings, and Marshall University String Orchestra as featured soloists. Cynthia's students achievements include participation in the following: Ohio University's Honor's Orchestra (under the direction of Steven Huang), WV All-State Orchestra, WV Governor's School of the Arts, Wright State University Annual Chamber Music Weekend, Mark O'Connor's Festival NYC, Marshall University's first Cello/Guitar Ensemble Day, Arizona Workshop for Strings, recitals at Marietta College, Ohio University in Athens, OH, various Suzuki Workshops, and WV Solo and Ensemble State Solo Recital Winners. Cynthia teachers include: Thaddeus Brys, Fern Glass, Sieva Lezhnev, David Littrell, Fritz Magg, Laurence Shapiro, and Mark Simcox. She performed in Master Classes with Stephen Katz, Fritz Magg, and Zara Nelsova. She enjoys her life as a musician in the company of her husband, David Puls, violinist, and her three children: Michael, Aaron and Rachael.